This chair has been discontinued. For more chairs, please see HERE..
Home Shiatsu Massage Chair / Recliner - Experience the ultimate relaxation of Shiatsu-style massage with 4 REAL Rollers. Now you can say goodbye to stress in this NASA-inspired near zero gravity position. Imagine countless hands and fingers slowly, continuously kneading and rolling your tired aching muscles. Powerful rolling wheels closely duplicate the hand movements of Shiatsu massage—kneading, stretching, rolling to de-stress stiff and achy muscles. You're in heaven! Before you know it, all the day's stress is gone. 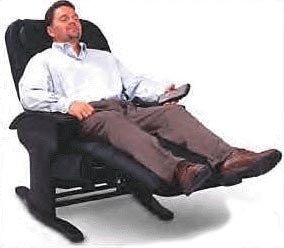 That's the relief you'll feel each time you ease into the Massage Chair. An easy-to-use remote control lets you customize your massage just the way you want. Choose from any of six unique massage programs that use real Shiatsu-style techniques. You can also choose the leg and seat vibration to soothe your legs after a long day on your feet. 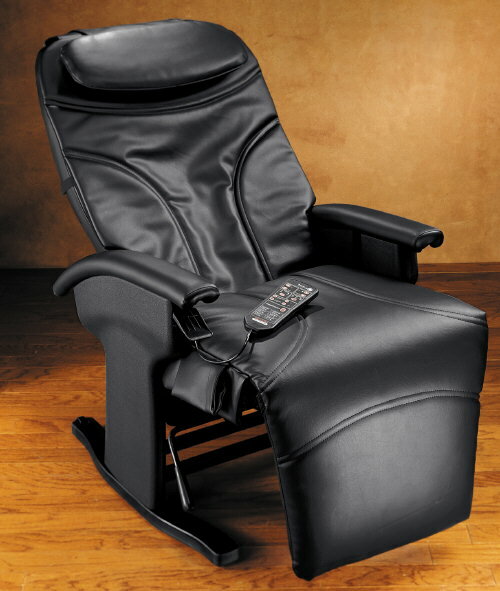 Massage chair is covered in comfortable, black simulated leather. Includes a soft, removable pillow to cradle your head. Dimensions: 44.5"L x 27.75"W x 48"H. Weight: 111.5 lbs.